1. Heat the oil in a large, heavybased pot over a high heat. Season the pork cheek with a pinch of salt then add to the pan. Fry for 4-5 minutes on each side until a deep golden brown then remove from the pan with a slotted spoon. Set aside. 2. Add the chorizo to the pan and fry quickly for 3 minutes until it begins to caramelise. Remove from the pan with a slotted spoon and set aside. 3. Add the onion, fennel and garlic and cook gently for 5 minutes until softened. Add the spices and sugar then cook for a further 2 minutes. 4. Return the pork and chorizo to the pan, pour over 600ml cold water and bring to the boil. Reduce the heat to a simmer, cover and cook for 2 hours, stirring occasionally. 5. Meanwhile, to make the salsa, combine all of the ingredients in a bowl and season to taste. Set aside. 6. For the frijoles, drain the beans and reserve the liquid from the can. Blitz half of the beans, the shallot and cumin in a food processor. Add enough of the reserved liquid to bring the beans to a smooth purée, then place in a small saucepan with the remaining beans and cook over a medium heat for 5 minutes until thickened. Add the lime juice, season to taste and set aside. 7. Once the meat is cooked, remove the pan from the heat and discard the cinnamon stick. Stir the meat for 2-3 minutes so the pork breaks up. 8. Heat the oil for deep frying to 180°C. Using a 9cm round cutter, cut 3 discs from each tortilla. Deep fry in batches for 30 seconds until crisp and golden. Drain on kitchen paper. 9. To serve, spread a spoonful of the frijoles on top of each tortilla disc. 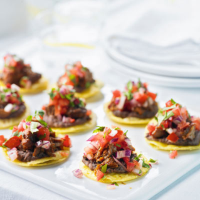 Top with a generous helping of pork and finish with a spoonful of salsa.